Apartment composting is a little more complicated than composting in a house. But it can be done without any stink or a lot of trouble. And you can buy a composter or build your own. If you live in an apartment, the first question is: what will you do with all the soil your composting creates? Apartment dwellers usually don’t have yards to grow food in, or any space suitable for more than little container gardening. Even if you do a lot of apartment gardening, you may not be able to use all the compost your kitchen generates. Another challenge is the issue of stink. When composting bins are working properly, they don’t smell. But sometimes things go wrong, and when that happens in a corner of your kitchen instead of a corner of your yard or garage, it’s gross. The actual composting itself is pretty simple. In composting, you have what’s called “green” and “brown” waste. Green includes kitchen scraps, coffee grounds, tea grounds, hair (it’s a good idea to chop up long hairs and spread them around) and green (living) yard waste such as grass clippings or leaves (but nothing with seeds, because you know what happens when seeds are put into rich soil). Brown waste includes dead yard waste, paper and dryer lint. Now you just need to fill your compost bin with roughly equal amounts green waste and brown. Err on the side of adding more brown if you’re not sure. If your compost smells like rotten eggs, you need more brown. After a few weeks – probably not many, since the amount of material you’re generating is likely small – it should have an earthy smell. You can buy a kitchen compost bin, or you can make one yourself. If you want to buy one, you have a lot of options. The basic kitchen compost bin is a small steel container with a charcoal filter to prevent smells. There are fancier options, but I can’t recommend any of them because the reviews are mixed. Generally, I don’t think you can beat a good steal container with a charcoal filter. You could also create your own worm composting bin. It’s not the simplest thing to put together – you’ll need some tools and some patience – but it should cost under $50. Worm composting done properly has no stink whatsoever. This design intentionally takes into account some of the problems you can run into and gives you a good start. There are troubleshooting guides to help you fix any problems that arise – worm composting is an extremely popular method. Keep your composting bin outside, if at all possible. If not, many apartment dwellers have successfully composted indoors. It can be done! If you’re concerned about smell, you can buy specially made kitchen composting bins with charcoal liners to keep the smell down. 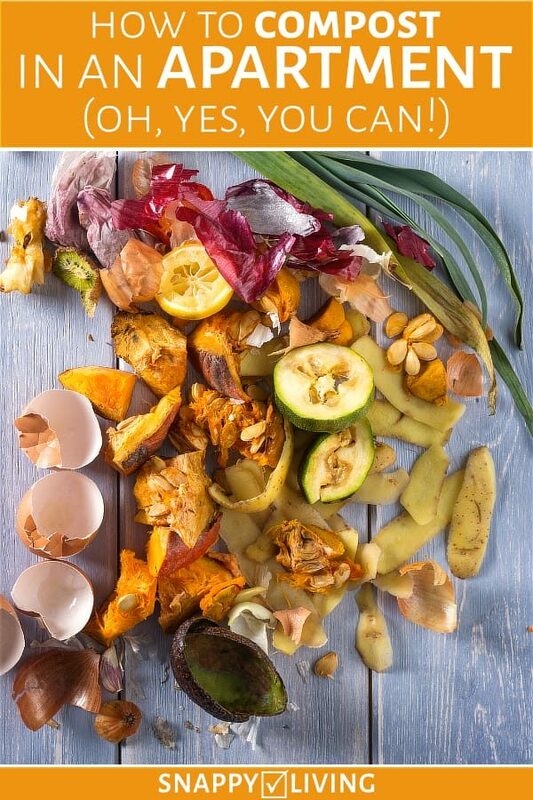 As I said above, the composting is fairly straightforward, assuming you can get your hands on some brown waste (and if you recycle your paper and add some cups of dirt to the mix, you should be fine). The problems are (a) finding somewhere to use all your compost and (b) the possibility of your compost stinking and annoying neighbors. Let’s deal with the second one first. As long as you keep your composting in an airtight container, it’s not going to smell. Especially if you use a composter with a charcoal filter. If you open up a compost container and find it’s stinky, close it back up quickly. Then collect some more brown material to add to your heap, open the bag, quickly add the new material, and close it back up again. At most, your neighbors will get a brief whiff. They probably won’t have any idea where it’s coming from. If this doesn’t fix the odor problem, check the troubleshooting guide. The bigger problem is actually using the compost you’ve generated. In an apartment situation, you’re very lucky if you can grow enough plants to actually use all the soil your composting will likely generate. What do you do with the excess soil? Give your leftover compost to friends and neighbors who can use it. A local farm might take it. Call your city. Some have programs for taking composted soil, or they might just have a use for it. The suggestions I gave for composting up above were pretty general. For more information on exactly which waste items are good for composting, Webecoist has some advice. Don’t worry – it’s not nearly as complicated as memorizing the list of things you’re not supposed to put down a garbage disposal. How Stuff Works tells you how to make two composting boxes, one for finished compost and the other for compost in process. Thanks, that’s very cool! I’ll definitely look into that. I’ll have to see if my landlord wants the compost. My city is really, REALLY far behind on getting the whole green thing. Drug stores won’t dispose of old meds unless you pay them, for example. Charities won’t take stuff unless it’s like new (as if a perfectly usable but slightly worn item wouldn’t be welcomed by people who need charity???). Of course, this is a city that’s known for tearing down perfectly good old apartment buildings and building brand new (cheap) ones in their place to avoid rent control (there’s a loophole for buildings constructed after 1978). It’s pretty vile, really. I’ve heard that Whole Foods has some sort of composting program. Surely if I do enough research I’ll find someone who’ll take it off my hands. And by asking people who’ve “never heard of that” and think it’s really “weird” I’ll be exposing folks to the ideas that they really need to embrace. Hey there, I realize I’m a little late to jump in here, but I figured I’d add my two cents. I live in an apartment and I have been composting for a couple years, on and off. However, I do have some outside space where I can keep my bin, so it makes it easier, and not as critical if the flies come around. But for the most part it’s never gotten smelly on me, so that’s good. I just wrote up an article about how I do it. I’m no pro, but it works, and my method is pretty simple and straight forward, and I didn’t buy any special equipment for my composting. Your situation sounds very much like mine – most people in my country (Singapore) live in apartment flats. Therefore composting at home is very rare, and our culture have yet to pick up recycling habits as well. If your still having a problem finding someone to take the compost try seeing if there is a CSA (or Certified Organics farm) anywhere near your town. I am signed up with a CSA to have all of my organic fruits and vegetables delivered to a drop spot in my town and I just have to go and pick it up. I drop off my compost for them to pick up when they deliver. You might try that. You could offer the soil to your neighbours in the apartment building – convenient and helpful! Hey! I know I’m super late in the game, but you could see if your city has a community garden, or if there’s a local college with an Environmental Science department or a trade school for agriculture/landscaping. Some churches would probably take it, too. One of the one’s in my area does a whole lot of gardening.